A big thinker who coined the phrase "Magnificent Mile," Rubloff built one of the first malls in the country and donated $6 million to the Art Institute of Chicago. After developing 21 suburbs, 10,000 houses, and 40,000 lots, he called himself "The World's Greatest Real Estate Promoter." A real life Monopoly master, he bought a single hotel, the Hyatt - passed Go - and turned the company into a massive world-wide chain. By the time the ink was dry on the 1794 Treaty of Greenville, he had consummated the greatest real estate deal in Chicago history by securing 36 square miles of lakefront property for the U.S. Government. As America fell in love with the automobile, Kissel cashed in by building a parking garage empire. 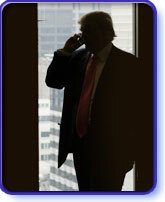 Donald Trump takes a call while visiting his Chicago offices and his 92-story residential tower on the Chicago River. A resurgence of construction projects in Chicago has taken place since 2000 unlike that seen since the 1960s and 1970s when the Sears Tower, John Hancock Center and other buildings helped give Chicago one of the most recognizable skylines in the world. In his beloved book On the Mississippi, Mark Twain wrote, "It is hopeless for the occasional visitor to try to keep up with Chicago . . . Chicago is always a novelty; for she is never the Chicago you saw when you passed through the last time." Yet even the occasional visitor must be astounded by the fact that the Windy City, in less than a century, grew exponentially from a town of a few hundred souls into one of the world's largest cities. The speed with which Chicago grew - indeed, continues to grow - was intricately tied to the local development of an innovative real estate industry. This industry included land speculators and platters; construction companies; real estate marketers, and lenders. Chicago has always been at the very forefront of the industry. In 1907 the American Land Title Association was created in Chicago, and it continues to play an important role in the conveyance of property. On May 12, 1908 real estate professionals met in Chicago at the YMCA and formed the National Association of Real Estate Exchanges - later changing its name to the National Association of Realtors. It would be difficult to overstate the importance of this organization to the field of real estate. The NAR created (and owns) the word realtor and is instrumental in the education and self-regulation of the industry. Naturally, the NAR still maintains its national headquarters in Chicago, the city from which it grew. 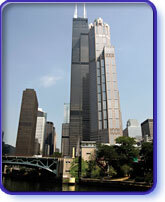 The Institute of Real Estate Management also makes its home in Chicago, reflecting the enormous role of commercial and residential leasing in Chicagoland. Today, more than 100,000 people are employed in the real estate, finance, insurance and rental industries; and more than 150,000 are engaged in construction in Chicago. These Chicagoans exhibit the same can-do spirit that turned "Cowtown" into what Norman Mailer called "the last of the great American cities." The expectation, then, is clear: Chicago will always be a novelty.